I wanted to do a short (let's see how short this really is!) 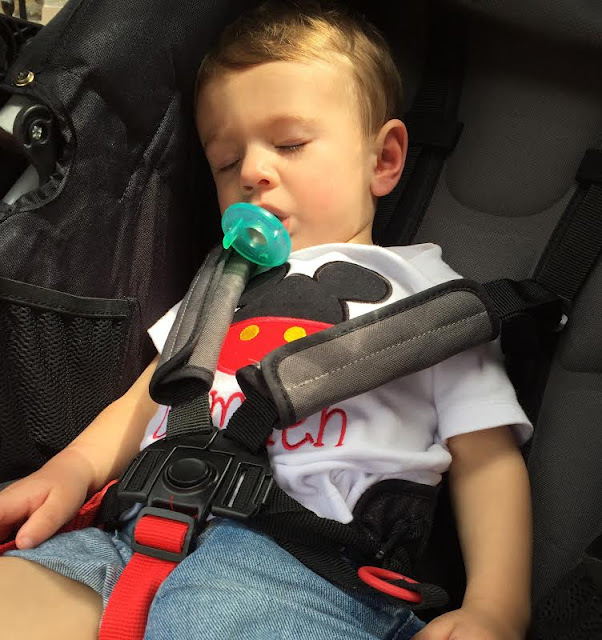 recap on the day we spent at Magic Kingdom, in case anyone is contemplating taking your baby/young toddler for a day. 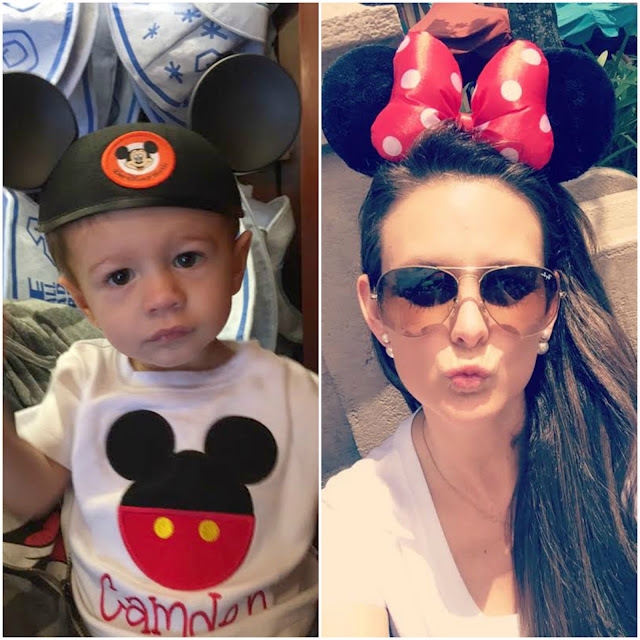 Like I mentioned before, we were only interested in making it a one day thing since Cam is still so young (15 months), so an early flight into Orlando was essential. Our flight got in at 830am and after picking up our luggage, rental car, and some breakfast we were in the parking lot at Magic Kingdom by 10:15ish. It was a cloudy day in the morning, but it never rained and the sun came out in the afternoon so it ended up being a really nice day. It wasn't too hot either and there was a breeze, so that was really nice! 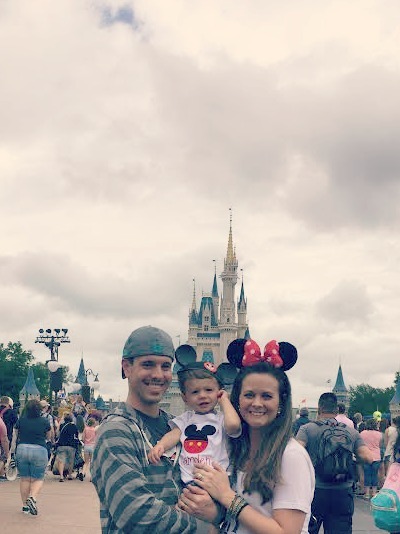 Our plan was to spend all day at Magic Kingdom and then leave around 7pm, when Camden normally goes to bed, so that he could sleep in the car for the 3 hour drive to Naples. It all worked out really well with (luckily) no bumps in the road, therefore we are so so happy that we did it. Camden enjoyed it so much more than we expected. It was truly amazing to see his face light up at the characters. The parades throughout the day that they had were great for his age because he could see all the characters, and the music was really loud and fun for him! On the rides we went on, he was really mesmerized by them, especially It's A Small World! I think he could have gone on that ride 10 times! The entire time we were there he kept eyeing and reaching for the Mickey Mouse balloons they sell, so of course we had to get him one. He loved it and carried it around with him EVERYWHERE for the next 4 days. I actually deflated it and brought it home with us to keep as a memento in his baby book, he loved it that much. ha. 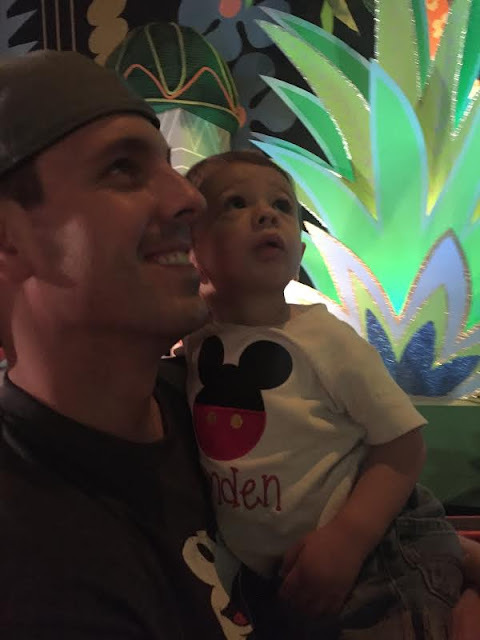 :) His favorite part of the entire day was meeting Mickey Mouse one-on-one in Town Square. For those who haven't been, they have it set up so just your family gets to go in a cute decorated room to meet Mickey and get your picture taken with him. 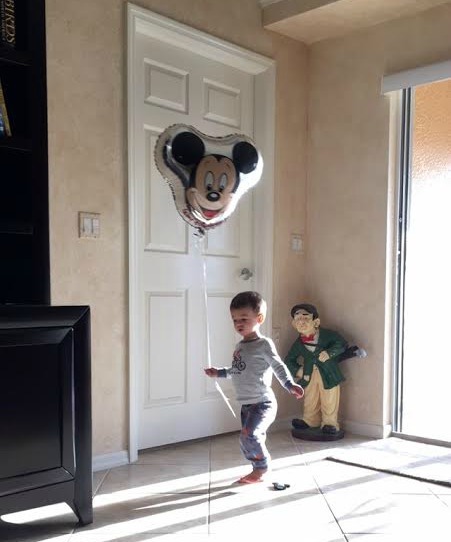 The second we turned the corner into the room and Cam saw Mickey, he practically jumped out of my arms and started pointed like crazy at him. Mickey "talked" to him for a bit and Cam wasted no time leaning in and gave him the biggest kiss on the nose! It was honestly the cutest thing I have ever seen! Truly a memory that we both will NEVER forget. He was literally starstruck and right then and there we knew we had made an excellent decision by taking him! I actually did get better group shots of our family by the castle (that aren't so blurry!) 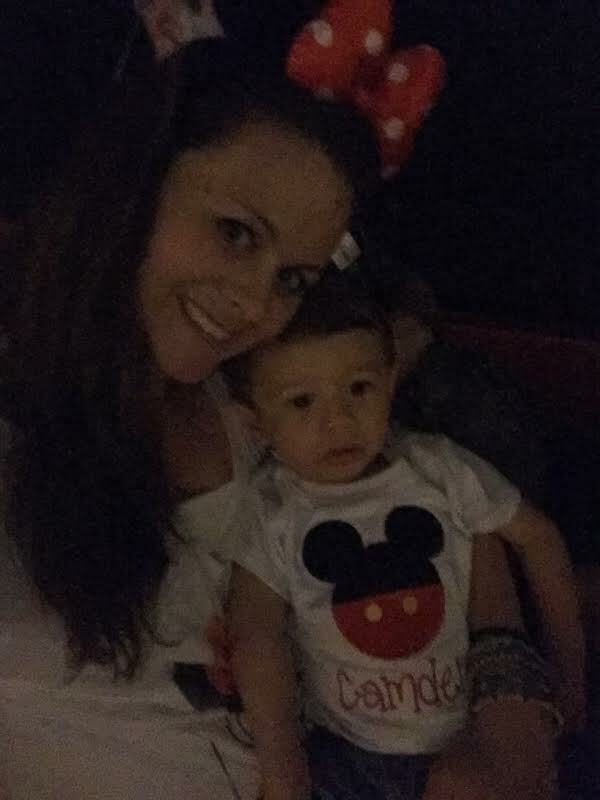 and pictures of all of us/Camden with Mickey Mouse, but I forgot to insert them into this post so I'll have to come back and add them! All of that being said, we are so glad we only did one day for a couple different reasons...1. There were only so many rides that he could go on, so it's not like we needed a week to fit everything in. and 2. It's really hard to get the most out of it when your child still needs naps throughout the day. Cam did take a nap in the stroller (very thankful we brought our BOB with us-because I don't think he would have napped at all in a small umbrella stroller) for a little over an hour, but he was still exhausted due to the excitement of everything. 3. It's exhausting for the parents, too! Billy and I both agreed that we think the perfect age to go is 5-6 years old when you don't have to work around nap times, they will remember it, and they can go on most of the rides. Billy already mentioned starting to save to take our kids back then, ha. I think it's also perfect/most convenient if you stay on property, so that you can come and go as you please when you get tired and whatnot. Once 6pm hit and we were all Mickey'd out, we decided to hit the road - happy but beyond tired. This preggo thought about Cam the whole time and did not take into consideration how much I would be on my feet (I actually had bruises and so much swelling in my right leg), so I took a long bath once we got to our place in Naples. So needed! Looking back on the day, it was totally worth it and we all had so much fun. 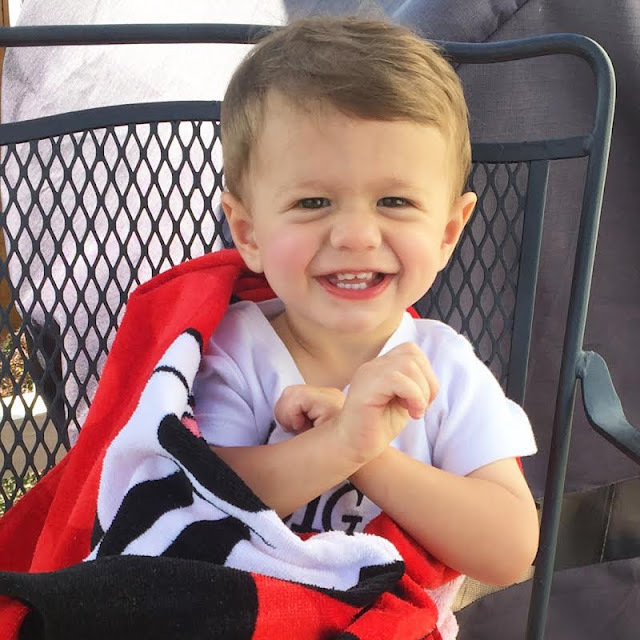 We know Cam really enjoyed it, which was all that mattered to us, and we can't wait to take him and his brother back many (many) years down the road, ha! Had to add in these pictures from this past weekend because Cam has been nonstop cuddling his Mickey Mouse towel... those smiles! too much! What a blast! 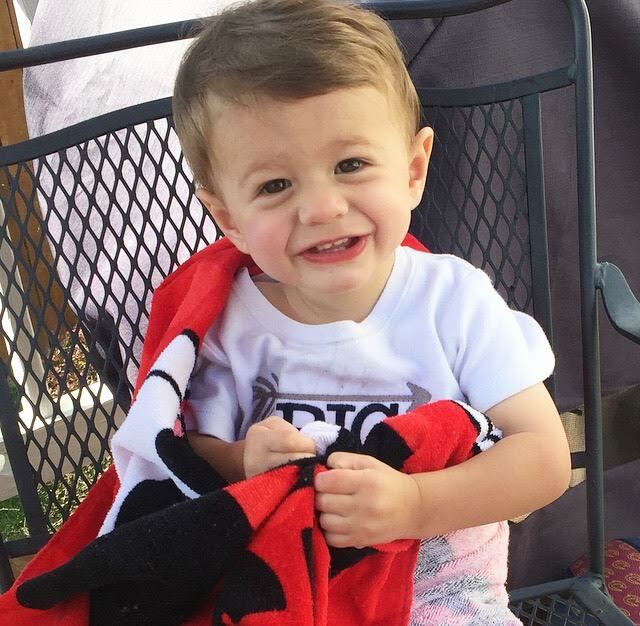 How old is Camden now? 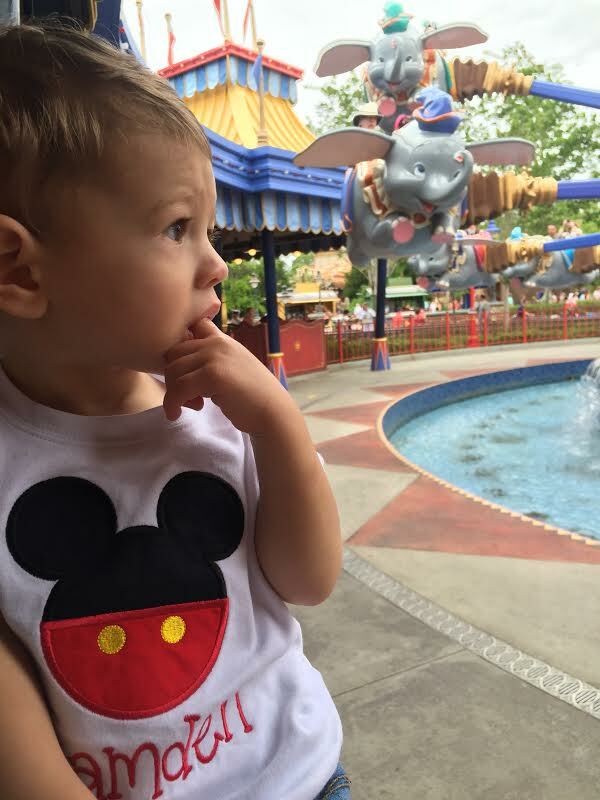 It seems like he is at the perfect age for a short first trip to Disney. He is such a sweetheart, it sounds like the trip was well worth it. 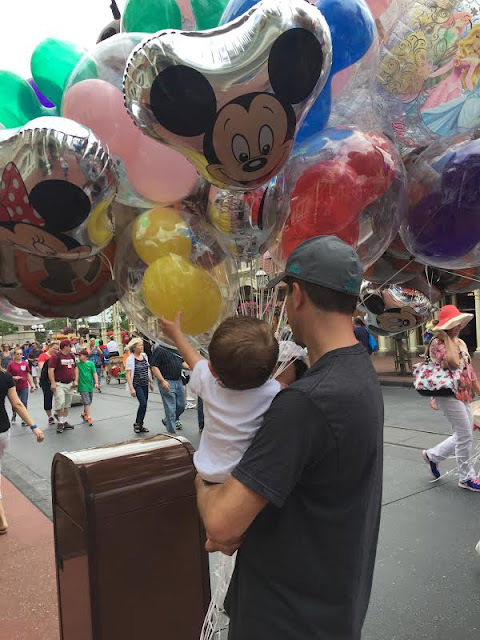 That story about meeting Mickey is too cute! Looks like so much fun!! Balloons are EVERYTHING in our house these days, too. He's such a dang cutie pie! 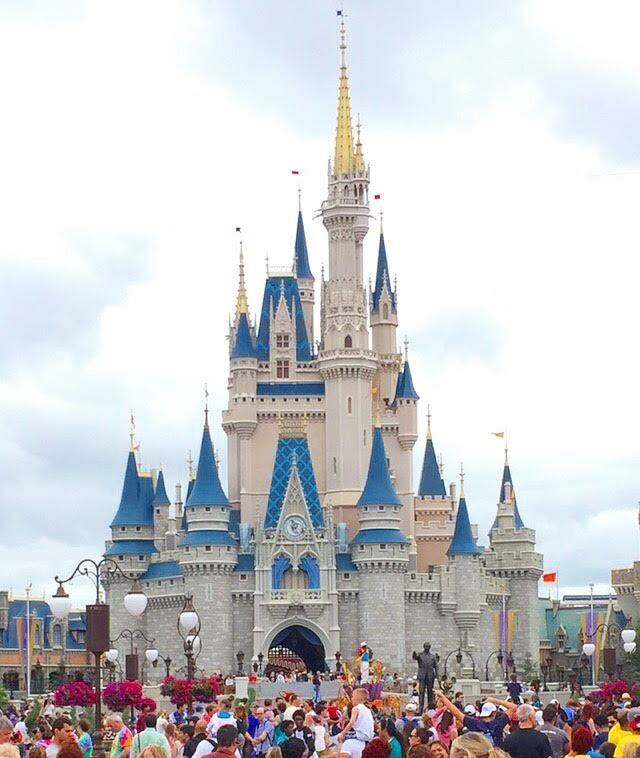 Definitely sounds like the best scenario for Cam's age group to go to Disney! And good to know about the fast passes for future reference! !